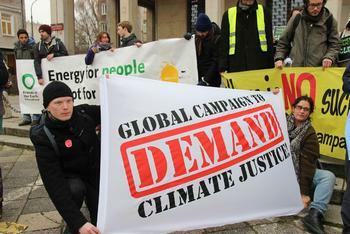 WARSAW, Poland, November 19, 2013 (ENS) – “The coal industry can and must radically transform and diversify to avoid the worst impacts of climate change,” the United Nations’ top climate official told the CEOs of major coal companies Monday in Warsaw. 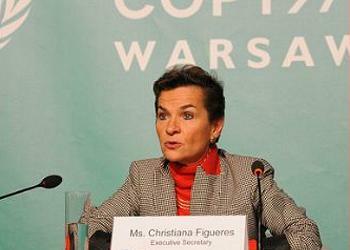 Figueres serves as executive secretary of the UN Framework Convention on Climate Change, which is holding its annual climate change negotiations in Warsaw. There are now 195 States Parties to the Convention and 192 Parties to its Kyoto Protocol, which limits the greenhouse gas emissions of several dozen industrialized countries and expires in 2020. The question of what happens beyond 2020 was answered by Parties at climate talks in Durban, South Africa in 2011. There governments agreed to deliver a new and universal “greenhouse gas reduction protocol, legal instrument or other outcome with legal force” by 2015 for the period beyond 2020. The negotiations in Warsaw this year and in Lima, Peru in 2014 are supposed to lay the foundation for universal adoption of a new legally-binding agreement in Paris in 2015. Speaking at the International Coal and Climate Summit, organized by the Polish government and the World Coal Association, Figueres urged the coal industry to honestly assess the financial risks of business as usual, to anticipate increasing regulation, growing finance restrictions and diminishing public acceptance and to leverage technology to reduce emissions immediately across the entire chain of coal output. “The coal industry has the opportunity to be part of the worldwide climate solution by responding proactively to the current paradigm shift,” said Figueres. She called on the coal industry to begin this transition by closing all existing subcritical plants. These are the least efficient coal-fired power plants, which emit more than 900 grams of the greenhouse gas carbon dioxide per kilowatt hour. Some experts say that would mean closing about three quarters of operational coal-fired power plants around the world, some 1.3 million subcritical plants. 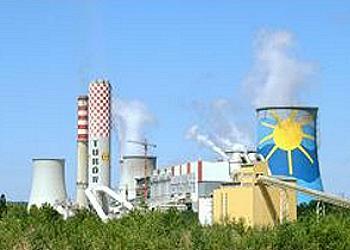 The vast majority of installed plants still use subcritical steam conditions, and cannot reach performance levels of state of the art technology. In fact, the total capacity of installed subcritical coal‐fired power plants reached a record high over the last five years, according to a 2012 report from the International Energy Agency. “These are not marginal or trivial changes, these are transformations that go to the core of the coal industry, and many will say it simply cannot be done,” said Figueres. “But the phrase ‘where there’s a will, there’s a way’ is tantamount to human history because will precedes innovation, and innovation precedes transformation,” she said. Demonstrators from Friends of the Earth Europe and Youth Friends of the Earth Europe gathered outside the building to make the point that there is no such thing as clean coal. They and many other environmental groups have signed the “People’s Declaration on Coal,” demanding an end to all new coal projects and for the United Nations to get coal out of the climate talks. Gomwe called on the international community to recognize that much of the developing world is turning to coal to fuel development. “If we were to raise the global average efficiency of coal plants from its current average of 33 percent up to 40 percent we could reduce global carbon emissions by more than two gigatonnes – that’s the equivalent of running the Kyoto Protocol three times over,” he exclaimed. “Modern highly efficient plants are also a key step towards near zero emissions from coal because they can be built ready for the deployment of carbon capture and storage technology,” Gomwe said.